The Cricut Maker: Why you need one in your life! September 18, 2017 / Jen T.
This post is sponsored by Cricut, but all opinions are my own...I genuinely loooove this machine! Affiliate links are included on this page. If you click a link and choose to make a purchase from Cricut, I will earn a commission. Thank you for supporting my business! You guys!!! 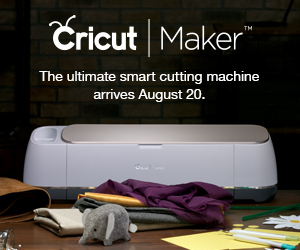 The crafting world as we know it has just had a major breakthrough, and it's all because of the brand new Cricut Maker! This revolutionary new machine has capabilities that are so cutting edge that they'll send your brain into a creative tailspin! I'm kind of a Cricut newbie...I mean, I just got my first Cricut machine (the Explore Air 2) earlier this year, so why in the world would I want a new machine? Well, I was lucky enough to be invited to Salt Lake City to attend the unveiling of the Maker, and after getting some hands-on time with the machine and learning all about it from it's creators, there was no doubt in my mind that this machine deserves a home in every craft room! Here are a few reasons why I am soooo excited to have a Cricut Maker in my life, and why I think you would love one, too! Of course, the Maker can do all of the things that were expected of it's predecessors...it can precisely cut paper and vinyl, allowing your imagination to produce countless masterpieces. BUT, what sets the Maker apart are the things it CAN do that it's predecessors CAN'T. The Maker has a rotary cutting blade! What does this mean? Well, let me tell ya! This blade has the capability to cut fabric...wait, let me rephrase that...this blade can cut over 100 types of fabric...with incredible precision! Since the blade seamlessly rolls across the fabric, the blade doesn't pull or snag, resulting in absolutely perfect cuts every time. Amazing, right? If you're like me and sewing isn't your forté, the introduction of this rotary cutter is a total game changer! I used the Maker to personalize this throw and didn't have to sew a stitch! Hallelujah! The possibilities are endless, y'all!!! If you do sew, your world is about to be rocked! Cricut has teamed up with Simplicity and Riley Blake to bring you hundreds of patterns...are you ready...that the Maker will cut for you!!! AND, the Cricut Maker has a fabric marker available that will mark all of the seam allowances for you, resulting in absolutely perfect seams every. single. time. Say whaaat? Cricut chose a test pattern and cut the pattern out by hand. It took an hour and 17 minutes. Then they used the Maker to cut the exact same pattern. Guess how long it took? Go ahead, guess. FIFTEEN MINUTES!!! Guys, this is unheard of! Not only does this save an unprecedented amount of time, but the cuts are perfect! No more crooked cuts or human error! Believe it or not, it gets better. I think the knife blade is what I am most excited about! This is a heavy duty blade with 4000 grams of power and the ability to cut heavy materials up to 2.4 mm. In crafter's language, that means this baby is gonna totally change your crafting capabilities!!! Wanna create something with genuine leather? Go for it. Wanna make a wooden script sign for your wall? By all means, have at it! Your only limit is your imagination!!! The new machine design has a place to hold your iPad or phone so that you can look at/interact with your project in Design Space as you are making it. Bonus? They included a charging port on the machine so you can plug in your device and not drain your battery. Genius! You can design on the go! Take pics of something that inspires you while you are out and about, then save them to the Design Cloud (aka Design Heaven) to access later and start your new project! The Maker has Bluetooth capabilities. I love this because my craft table and computer are not conveniently located next to each other, so wiring them together could sometimes prove to be pretty inconvenient. Now, I just connect to the machine on my Mac via Bluetooth and craft away. It makes things soooo much easier! Design Space (the Cricut design software) has been updated and it is incredibly easy to use! Instead, maybe you should get your own Maker and find out for yourself! In the meantime, here's a sneak peek of the Maker in action as I was making the initial for the throw blanket. Stay tuned for a DIY on that coming soon!